Don't just see it, explore it with US Divers Magellan LX Purge Mask + Tucson LX Snorkel. This amazingly functional combo features a super soft and durable 2-window mask with Hypoallergenic silicone face skirt for ultimate comfort and leak free fit, a silicone squeeze buckle system for easy adjustments, an ergonomically shaped mouthpiece for great comfort, and a one-way purge valve. Don&apos;t just see it, explore it with US Divers Magellan LX Purge Mask + Tucson LX Snorkel. This amazingly functional combo features a super soft and durable 2-window mask with Hypoallergenic silicone face skirt for ultimate comfort and leak free fit, a silicone squeeze buckle system for easy adjustments, an ergonomically shaped mouthpiece for great comfort, and a one-way purge valve. Prevent splashed surface water from entering snorkel barrel. This advanced tube snorkel top design keeps splashed surface water out because the water "adheres" to the inner surface of the snorkel top, routing it safely out and away from the breathing tube. Hydro-Adhesion™ Technology also provides excellent, unobstructed airflow and easy purge (clearing) capabilities. 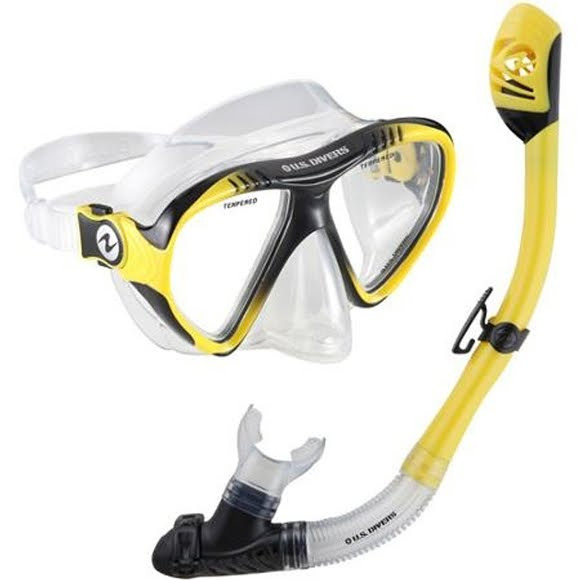 US Diver&apos;s top snorkel technologies, both the Pivot Dry™ and Dry Top snorkels are designed to keep all water out of the breathing tube whether above or below the surface of the water. These dry tops act as splash guards while on the surface of the water, and close automatically when submerged to seal out any water. The Pivot Dry™ and Dry Top technologies also provide excellent unobstructed airflow and easy purge (clearing) capabilities.